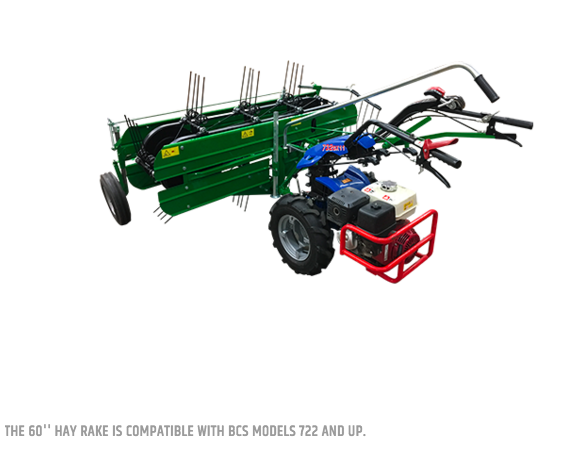 The 60” Hay Rake attachment for BCS two-wheel tractors is a great way to quickly rake mowed grass into windrows, especially when compared to the time and effort required to rake with hand tools. A professional piece of equipment, the rake is manufactured by Molon Machinery of Italy, which specializes in hay-making equipment. 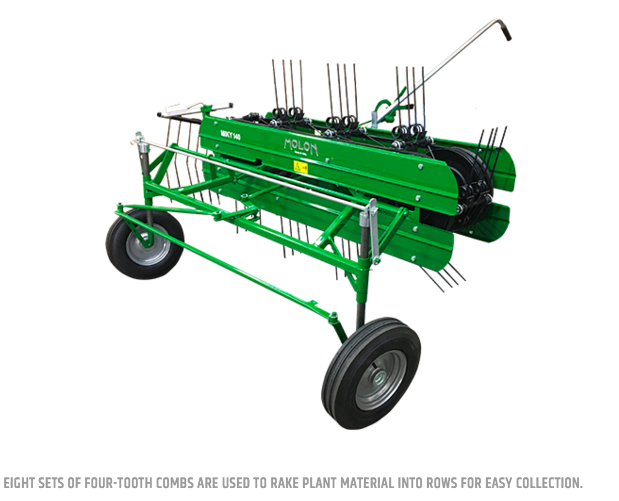 The Hay Rake features eight sets of four-tooth combs that rotate on two heavy-duty belts driven by the tractor’s PTO. 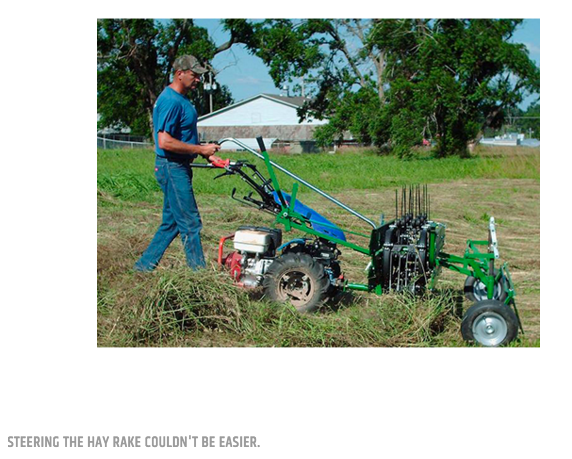 The unit rakes hay, grasses, and other cut plant material and is a nice tool to complement the Sickle Bar and Duplex Sickle Bar mowers, which cut plant material once at its base and leave it in tact. 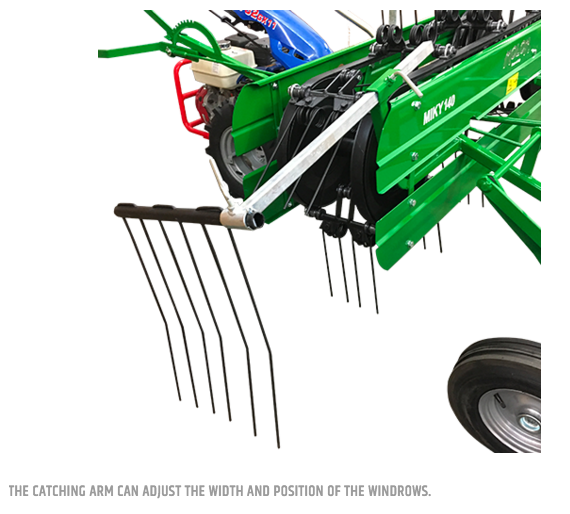 The width and position of the windrows is controlled by the adjustable catching arm located on the right side of the rake. 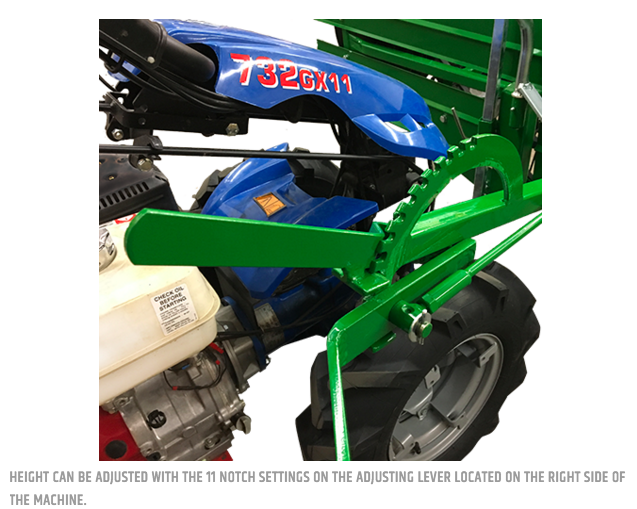 A height adjustment lever, also on the right side, has 11 notched settings and sets the height of the rake teeth above the ground. Properly set, the teeth will cleanly sweep all cut material and create a windrow that can then be baled or forked into a wagon. In its lowest setting, the combs can also be used to de-thatch lawns. The rake requires little effort to maneuver. Two 15” wheels in the front are controlled via the steering lever located at the operator’s position. 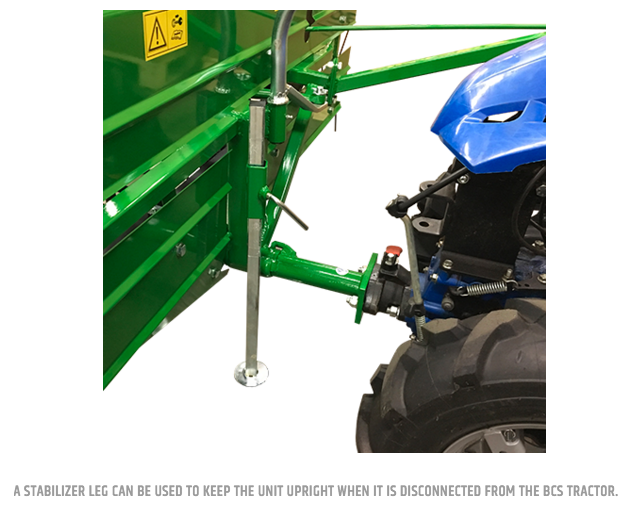 A stabilizer foot located near the PTO connection point allows the unit to be supported when it’s disconnected from the BCS tractor. The Hay Rake can also be converted into a tedder to re-spread the plant material in case it has gotten wet. Raising an adjustable metal strap and securing it with a hitch pin raises the right side of the unit higher than the left. 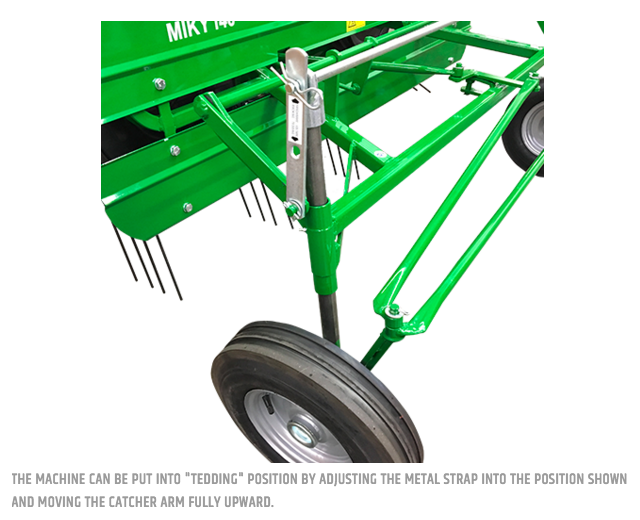 With the catcher arm positioned fully upward and out of the way, the grass material can then be discharged and spread evenly to aid in drying the material before it is raked into windrows again for collection. 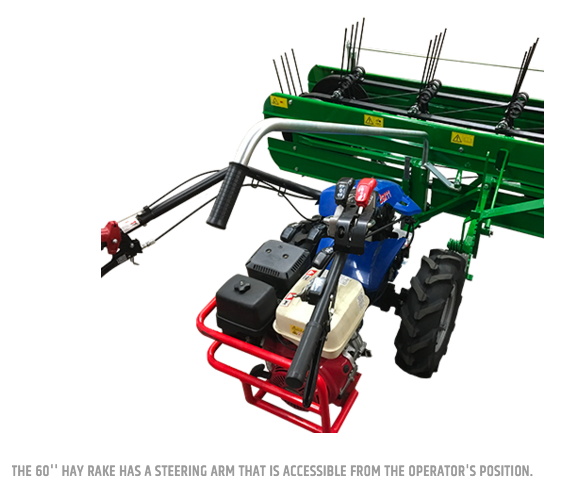 No accessories are required to operate the Hay Rake attachment. Attachment price only. Fits models 722 and up. Two wheels controlled by steering lever. At lowest setting, rake can be used as a lawn de-thatcher. Converts to a tedder to re-spread and dry plant material. Fits models 722 and up.